While you were probably catching up on some sleep and drinks with friends over the weekend, close to 50 hackers gathered at Baidu’s inaugural Open Cloud Green Living hackathon in Singapore. According to an infographic by MyCorporation, green tech is one of the hottest growing industries of 2013, and that inspired Chinese search engine Baidu (NASDAQ:BIDU - News) to adopte the ‘green lifestyle’ theme for the hackathon. The company also sees huge potential utilizing mobile technologies in this green-tech area. Hackers, gathered at Plug-In@Blk71, were required to hack from tools available from the Baidu Developer Center. According to Baidu, some of the more popular tools used during the hackathon included Personal Cloud Storage (PCS), Baidu App Engine (BAE), and Social Log-in, a feature that allows users to log into apps with their social network accounts 1 . The final 5 standing After 36 hours of non-stop hacking, these are the final five: 1. Team Green Day with ‘SSOHO (Social Smart Home)’ This automatically detects human presence and controls the lighting and temperature conditions within the smart home in the most energy efficient way possible. Little features include increasing the lighting to wake you in the morning. The team won the hearts of Baidu’s adjudicators, walking away with the top ‘Green and Creative’ prize. 2. Team SmartSell with ‘SmartSell’ ‘SmartSell’, as the name suggests, facilitates smart selling of products. Using image-recognition technology, you can snap a picture of something you want to sell and get a possible match and a suggested name and price-tag. Users can also edit the information of the item that he or she is selling. SmartSell walked away with Baidu’s ‘Best Use of Cloud’ prize, and was the first runner-up in the partner cash prize provided by ETPL. 3. Team Burpple with ‘Balance’ The popular social food search startup Burpple sent its team down to participate in the hackathon. Product Balance, as team Burpple (pictured right) describes it, is a fast and simple way to make sure that your diet is balanced. It helps to keep track of diets using a simple health indicator, without you having to count the calories. Burpple impressed both Baidu and ETPL, coming in as second runner-up for the partner’s prize and walking away with Baidu’s ‘Best Market Potential’ prize. 4. Team Carousell with ‘Carousell Green’ Up and coming m-commerce marketplace Carousell is also keen to streamline the online selling process. Users can create free listings and sell items in less than 30 seconds. With a specific focus on re-sale and re-use of textbooks alone, it is estimated to save 9.1 kilograms of carbon dioxide produced per textbook, equivalent to the amount produced by 659 cars. Carousell is the top favourite of ETPL, coming in first in the partner’s prize. 5. Team Friendoc with ‘My Friends’ Footprint’ Developed using Baidu’s Map API, Social Log-in, and Geo-coding API, this hacked-together product gives a summary of users’ footprints which will be generated according to the geographical information from users’ camera album. The results will be displayed on a map that can be shared with friends through social networks. Users can also develop digital postcards in each city and send them to friends. Friendoc scooped Baidu’s ‘Crowd Pleaser’ prize. Looking to make China greener With at least 300 million people in China using mobile devices, Baidu’s chief architect for Baidu Cloud Hou Zhenyu hopes that more Singaporean entrepreneurs tap into the support that Baidu and its partner has provided. Baidu’s joint research Lab with A*STAR opened in February 2012 in Singapore. 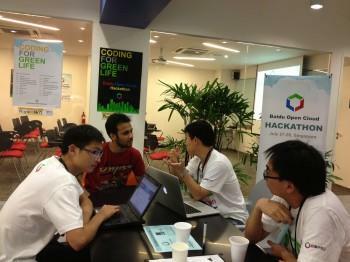 The hackathon was also held in Beijing, Chengdu, and Wuhan prior. It was also held simultaneously in Taipei, adopting the exact same green theme. Both Taipei and Singapore events saw a turnout of more than 100 on the final day. The Singapore event had nine teams competing for the prizes, supported by local partners such as InfoQ, SegmentFault, QuestVC, and World Wildlife Federation (WWF). 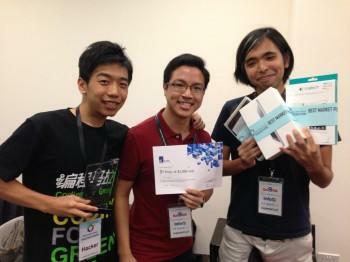 The post These 5 Baidu Hackathon Finalists Make Your Life Greener and Simpler appeared first on Tech in Asia.